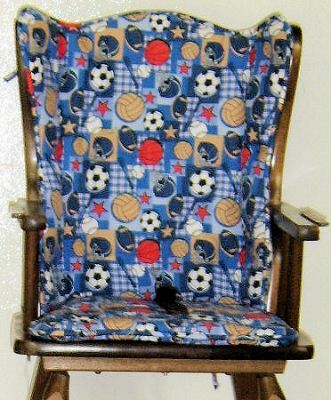 Wooden highchairs get passed down through generations but the cushion doesn't always survive as well as the chair. All highchairs are not the same. 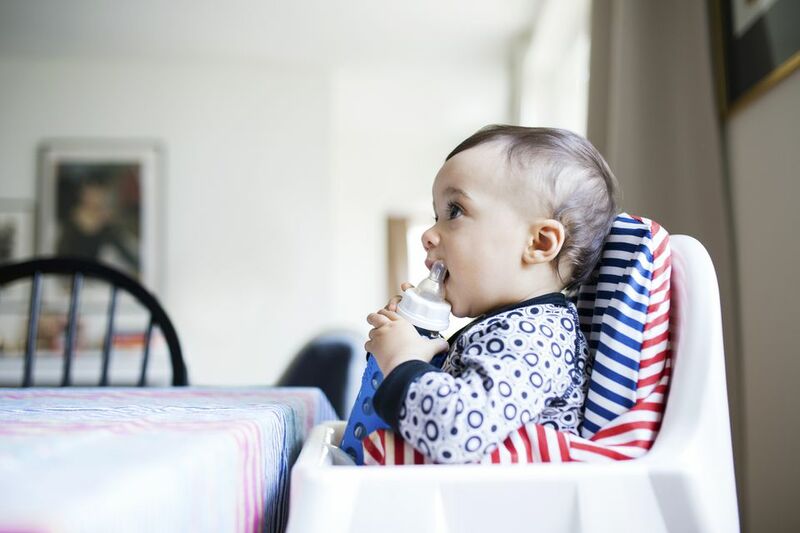 These directions will guide you through the steps to create a custom pattern and sew a custom cushion for a highchair. Add a 1/4" to 1/2" seam allowance to all edges of the pattern. Mark the location that you will need to attach ties to hold the cushions in place. Mark anywhere you need an opening for a strap, a fold or other need. For a corded edge—Cut bias strips for piping cover. For ruffle edge —Measure around the edge of the pattern and cut strips that are double the length of the edge of the pattern and wide enough to be folded in half for the desired ruffle and seam allowance. Sew a ruffle in place of piping for the remaining instructions. Fold the tie strips in half with the wrong sides together. Open the strip and fold the edges into the newly created fold line. Re-fold the first fold and press well. Cut the strip into the desired length for the ties, leaving extra to turn in one end of the strip. On one end of each strip, turn in the end to enclose the raw edges. Sew close to the folded edge to hold the tie closed. Sew the unturned end of the ties to the back fabric pieces where you marked on the pattern pieces. In the example, the seat will be sewn to the back cushion. Sew the back and seat together at the back of the seat using the chosen seam allowance. Leave an opening in the center of one seam for turning the cushion right side out later. Press the seams and apply a seam finish. Attach the piping to the front fabric pieces, using the seam allowance that you chose when creating the pattern. Clip the seam allowance where needed for the edges to lay flat. Placing right sides of the fabric together, line up the edges of the front and back of the fabric pieces. Pin in place, matching any seams and curves. Sew using the piping stitches as a seam guide. Trim the seam allowance if needed and apply a seam finish. The choice of padding for your cushion is yours. If you choose to use batting, you will want multiple layers for enough padding. Using the pattern pieces you created, without the seam allowance added, trace the pattern on to the padding. Optional: Use basting spray to hold multiple layers of padding together. Line the edges of the padding up with the seams on the fabric. If needed, hand baste or tack the edges of the pad to the seam allowance to hold it in place while you turn the fabric right side out. Smooth the padding and fabric. Use evenly spaced bar tacks or quilting to hold the padding in place. Using your pattern as a guide, mark the places you need an opening for a strap to pass through the cushion. Measure the width of the strap that will need to pass through the opening, allowing a bit extra to prevent tearing the fabric. Sew a buttonhole at the strap passing location.